Turia She was built on 1931 by Euskalduna Naviera Pinillos as Turia, name kept until being scrapped. During the Civil War she was on the Republican side, being at its service making trips both by the Mediterranean and by the Cantábrico until she was returned to her shipowners on January 1939. On 1964 she was bought by Suc. Vda. de Enrique Illueca, being transformed and changing completely her look. She was scrapped on 1978. 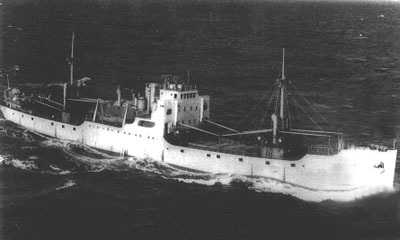 On 16/February/1941 she was the first of the chain of ships that passed the notice that Santander was suffering a big fire that devastated much of the city. The land communications were completely cut. The Turia, that was berthed, began to transmit the distress call. The message was listened by Monte Ayala, that began to relay it being listened by the Cristina, which relayed it again. Finally the message was heard at La Coruña, from where all Spain was warned.